This is documentation of ESP-ADF, the framework to develop audio applications for ESP32 chip by Espressif. The ESP32 is 2.4 GHz Wi-Fi and Bluetooth combo, 32 bit dual core chip running up to 240 MHz, designed for mobile, wearable electronics, and Internet-of-Things (IoT) applications. It has several peripherals on board including I2S interfaces to easy integrate with dedicated audio chips. These hardware features together with the ESP-ADF software provide a powerful platform to implement audio applications including native wireless networking and powerful user interface. 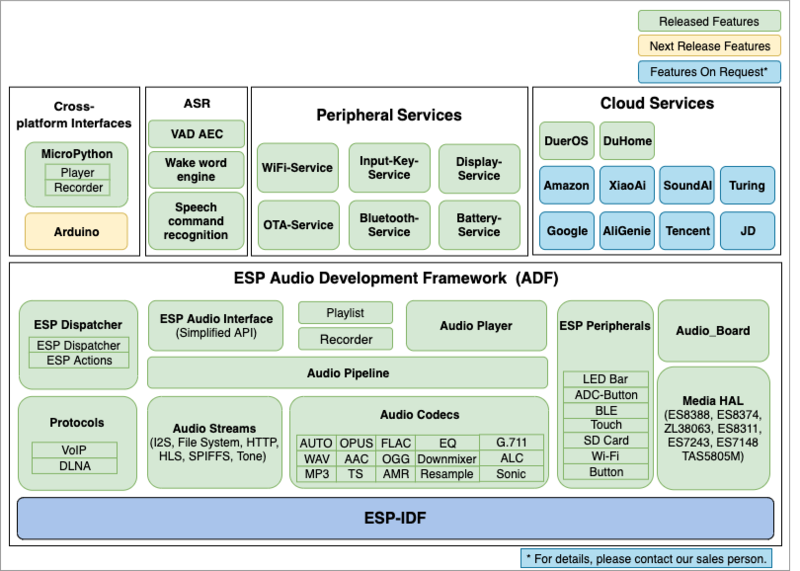 The ESP-ADF provides a range of API components including Audio Streams, Codecs and Services organized in Audio Pipeline, all integrated with audio hardware through Media HAL and with Peripherals onboard of ESP32. The ESP-ADF also provides integration with Baidu DauerOS cloud services. A range of components is coming to provide integration with DeepBrain, Amazon, Google, Alibaba and Turing cloud services. The ESP-ADF builds on well established, FreeRTOS based, Espressif IOT Development Framework ESP-IDF.